For all the obscure festival releases and challenging documentaries I see, all the high-brow foreign dramas and such, you’d be forgiven for thinking that most of what I watch is, well, not that fun. Or at least, not the kind of fun one is usually looking for on a night out at the cinema. Friends, I’m here to tell you that not only do I see those other films, the ones made for the spectacle and popcorn, but you know what? I enjoy the hell out of them. I took myself to see Guardians of the Galaxy a couple years ago. I voluntarily made my way through seven Star Wars films, and now I get what the fuss is all about. What I’m saying is, sometimes you just need a fun time at the movies. Free Fire is that fun. Ben Wheatley’s latest (High Rise), set in the 1970s, is an arms deal that quickly goes bad and the resulting 90-minute shoot-out, as both sides try to make it out alive. Brie Larson, Armie Hammer, Cillian Murphy and Sam Riley lead an ensemble cast of smart-asses and dip-shits who infuse a brutal gunfight with humor and, believe it or not, a bit of sympathy. We open on Riley’s Stevo, beat up from a bar brawl, and his equally dim cohort as they drive up to a warehouse. It’s the dead of night, and Larson’s Justine is waiting in a station wagon with Murphy’s Chris and Frank (Michael Smiley). She’s an ambassador of sorts, having arranged the deal for these two, who plan to take the loot back to Ireland. They’re waiting for Ord (Hammer), who’s got the goods via Vernon (Sharlto Copley) and Martin (Babou Ceesay). Inside the warehouse, a few more goons join this motley crew to help with the transport, and that’s when the whole thing starts to fall apart. The deal, that is. The movie is just getting started; we’re only about twenty minutes in at this point, after all. Stevo recognizes one of the guys (Jack Reynor, a total ringer for Seth Rogan and the breakout star of Sing Street) as the thug who beat him up, and despite his best efforts, is recognized right back. Thankfully, Wheatley and co-writer Amy Jump find enough material in their troupe of criminals to keep things moving along at a nice clip. Ord is always ready with a clever one-liner. Vernon just wants to get the money and keep is suit clean. Are Chris and Justine flirting? Yes, yes they are. The warehouse itself is utilized ingeniously; it becomes a sort of video game level, odd machinery and fittings serving as both protection and obstacles as the shoot-out escalates. And escalate, it does. Over 7,000 bullet blanks were used in the production; gotta figure at least some of them are going to hit their targets. It’s no spoiler to share that not everyone in this gun battle is going to survive (though in fact, several of them survive longer than you’d think!). I’ve been known to wince at bloody Tarantino shoot-outs, or cover my eyes during particularly violent Scorsese scenes. Over an hour of non-stop gunfire might sound overwhelming, and it certainly isn’t always easy to watch. But in its excess, and as the whole warehouse spirals more and more out of control, if you’re not at some point thinking about the absurd level of gun violence in our culture, you’re missing the point entirely. 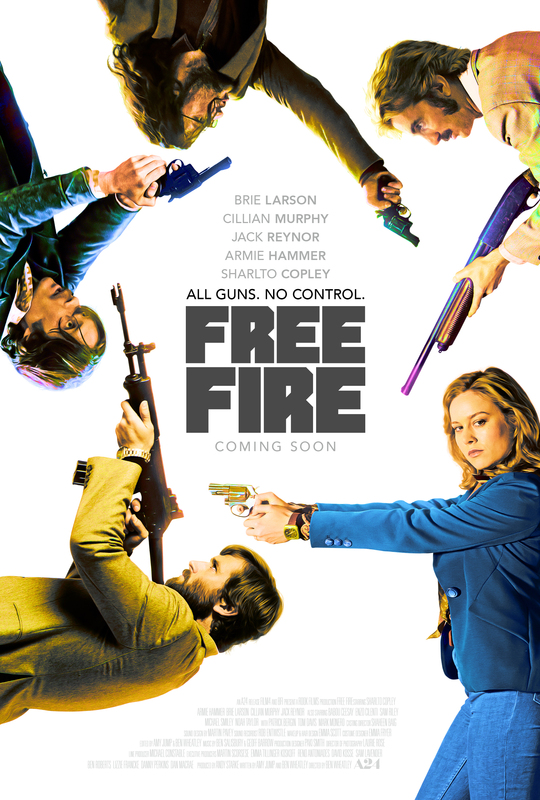 Free Fire won’t be remembered for its emotional impact or its awards-bait performances (there isn’t much of either). It’s not your typical arthouse, festival fare (though it did premiere at SXSW). But what it is – a period piece, a shoot-’em-up, a snark-fest, and perhaps even a social commentary – is a whole lot of fun.